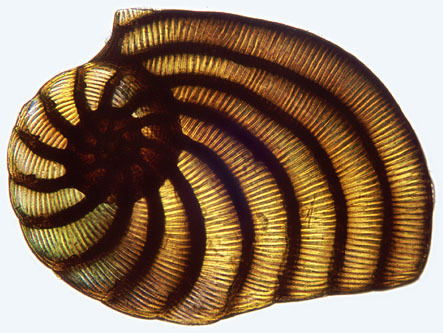 The curled tests of the forams of the genus Peneroplis gives them the appearance of a miniature ammonite fossil, although in this situation they are recent and not fossil. These and related species are very common in the Mediterranean from the Spanish coast to the Nile delta and also in other parts of the world where similar conditions exist. This foram does not show the distinct little punctures. Many species are furnished with a sieve like aperture through which the protoplasmic body can flow rather like Amoeba. The design of the aperture is used to name many of the species. Most Foraminifera have a somewhat complex alternation of generations. Those produced by asexual means of budding tend to have a large first chamber but those produced by sexual means have a minute first chamber. Comments to the authors Wim van Egmond and Brian Darnton are welcomed.